In November of 2000 Rocky Mountain Power donated 22.6 majestic canyon acres in Cedar City to create a permanent wildlife rescue facility and nature park. Nestled between beautiful red sandstone mountains, this property sits on the transition point between the Colorado Plateau and the Great Basin. 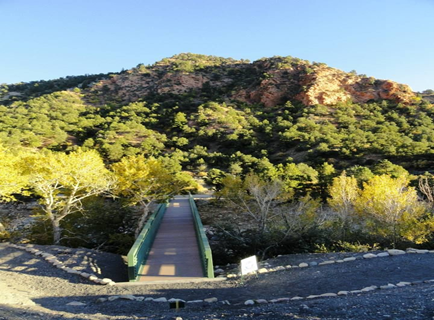 In the spring of 2003, a paved walking and bicycle trail was built through this property with matching funds from Utah Division of Parks and Recreation and Cedar City connecting the 23 acre nature park to the city’s existing trail system. In 2004 the National Park Service awarded a technical assistance “grant” to plan and build support for the development of the Southwestern Utah Nature Center. Current plans include the design and construction of an Information Destination and Restroom Facility. Robert L. (Roy) Tryon, licensed architect has designed a 315 sq. ft. restroom facility which includes a 10.67’ x13.33’ space between two unisex ADA restroom units that will accommodate a maintenance quad, all utilities (power, water, sewer, light, heat) and all tools and equipment that will be needed to maintain the Park until large structures and facilities are built on the north side of the Creek. The exteriors walls of this concrete block building will feature eight slightly recessed wall panel areas (64” to 72” wide by 64” high) that will accommodate information and interpretive displays. Topics will probably include the SWF mission, past and present wildlife projects, notable releases, native wildlife and plant species, master plan, community outreach and activities, Groovefest, Eagle Scout projects, etc…whatever is happening and interesting to site visitors. Eventually the plan is to build a visitor center which will provide information, exhibits and programs on wildlife, plants, the environment and natural history.